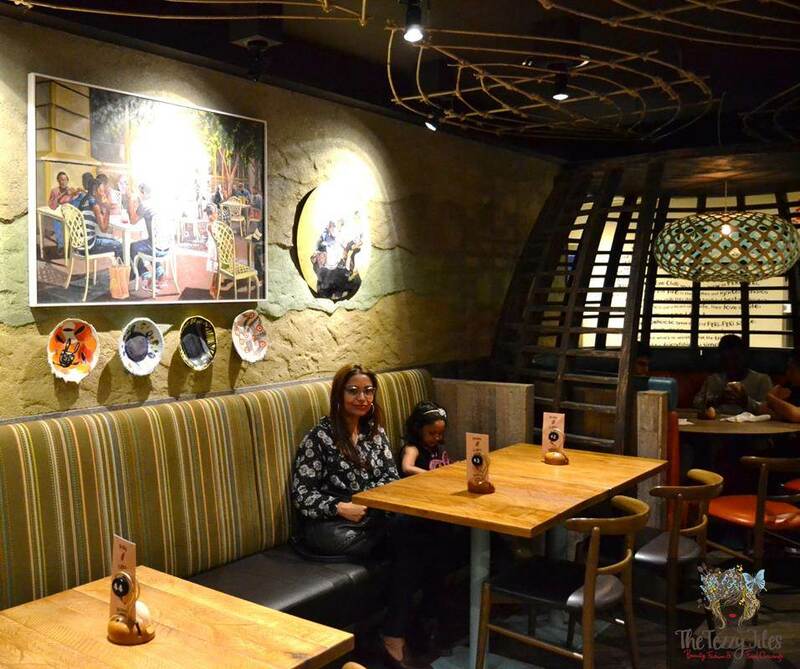 Nando’s has long been a family favorite. We love our spicy food, and given its budget-friendly menu offerings, their flavorful fire-grilled chicken makes a far healthier alternative over regular junkfood. *Colonel Saunders heaves a heavy cholesterol-laden sigh*. 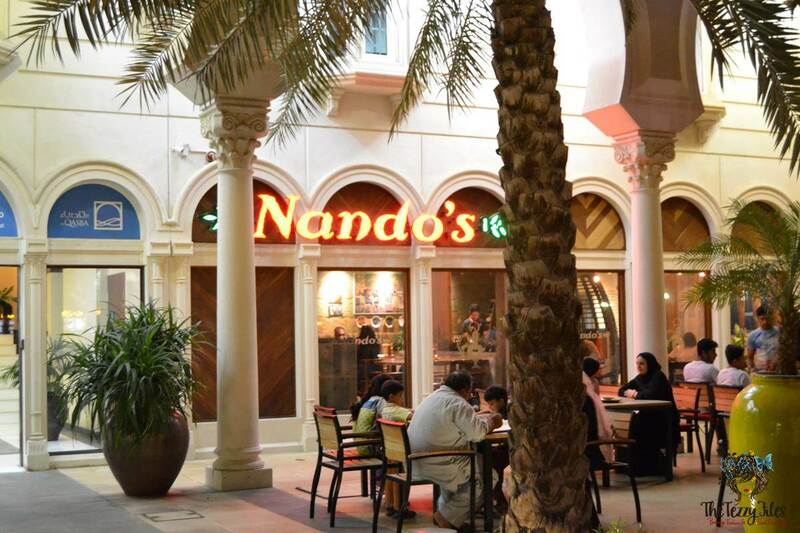 Last weekend, we drove up to Al Qasba, Sharjah and ended up having dinner at the Nando’s branch there. 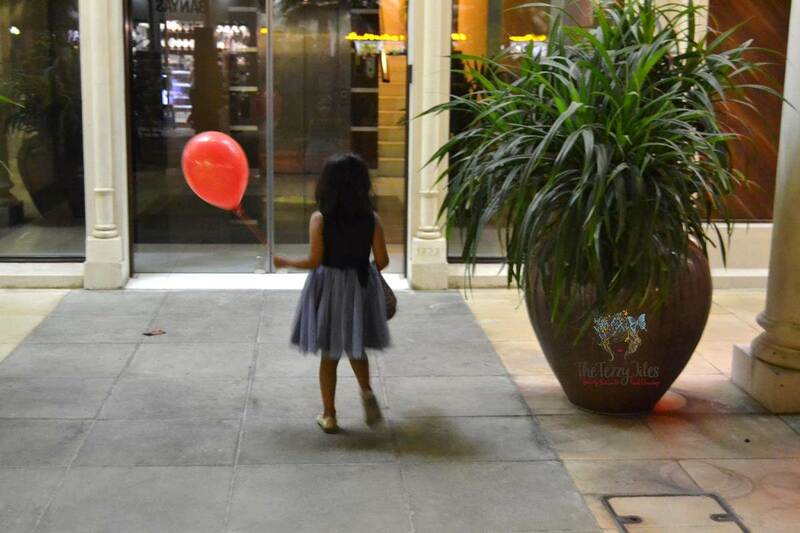 Have you been to Al Qasba Sharjah? The long strip of restaurants by the canal has a magically festive vibe about it. Perhaps its the cobbled walkways and dim golden lighting. 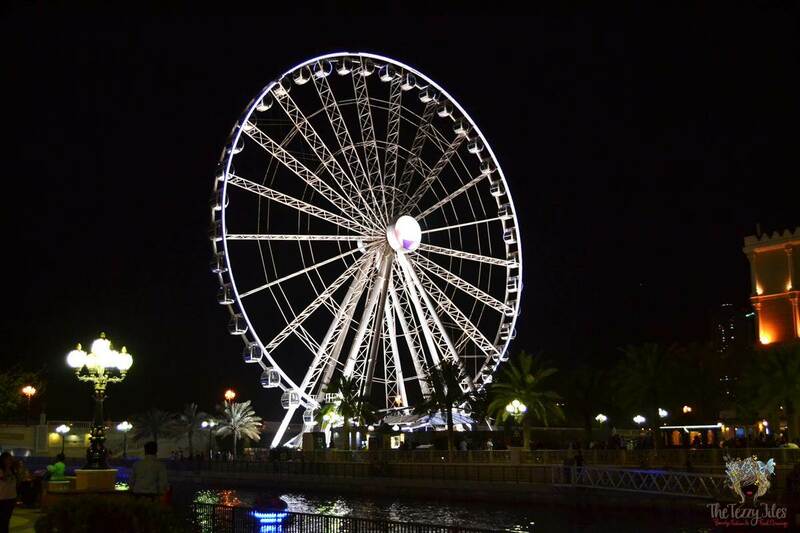 Perhaps its the giant Etisalat wheel, an icon of this Emirate; or perhaps its the merriment of the people who gather here that makes this place so special. Al Qasba is an Arabesque take on what I envision Venice to be, and yes they have gelato in the vicinity as well! It was my first time at Nando’s, Sharjah. I last had Nando’s in New Zealand during my trip back home in August. This was a treat from my parents to commemorate on a very special family anecdote. My daughter Farasha, who is now four, was born in New Zealand. She was due at the end of January, and my mother had taken special leave to be with me and help out with her very first grandchild. On Sunday 16th Jan, 2011 I was accompanied by my entire clan to the local Nando’s joint. With the appetite of a heavily pregnant woman who loves the heat of chili, I ordered the 1/2 Chicken with Extra Hot Peri-Peri sauce. The heat of the Peri-Peri kept me up all night, and I made several nocturnal visits to the loo. At the breakfast table the next morning, my concerned father asked if I was alright. ‘Oh its nothing’ I said, ‘just a little chili disagreeing with my bowels!’. My brother agreed wholeheartedly, and said he was going through the same dilemma. But the stomach cramps wouldn’t stop. They grew by the hour, then every half hour, soon every minute! My midwife was called. ‘You’re in labor!’ she announced. This should give you a fair idea of how hot the Nando’s Extra Hot Peri-Peri sauce can be. I confused its heat with labor pangs! In the early hours of Tuesday 18th January 2011, my little cherub was born. My siblings argued she should have been named Nando! Farasha is still too little to understand the significance of this family anecdote, but she has inherited my foodie genes and loves dining at Nando’s! 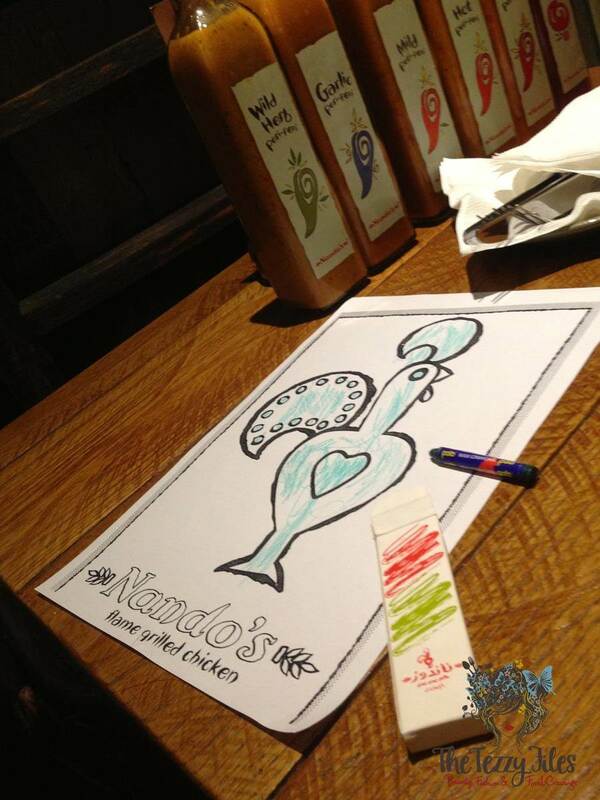 Nando’s is a child-friendly diner. 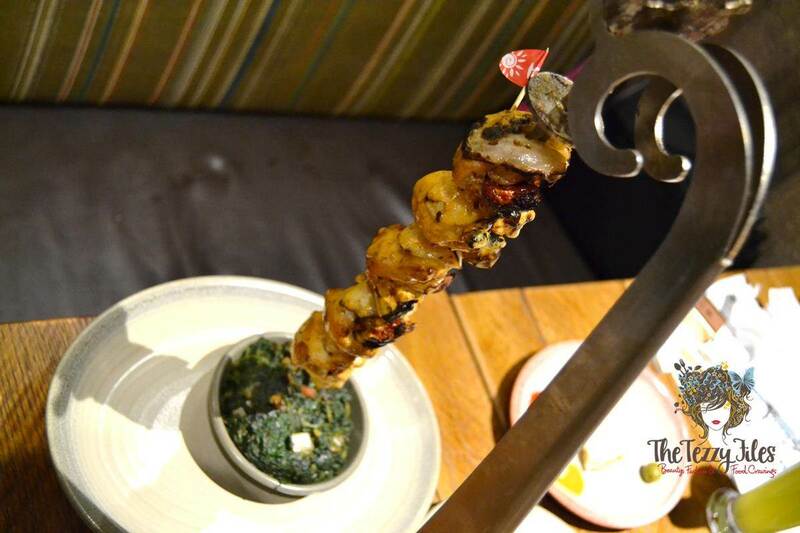 While we busied ourselves over the menu options, Farasha was kept preoccupied with coloring the Barcelos Cockerel. Do you know the legend of the Barcelos Cockerel? (Yes, this post is full of anecdotes!). The story goes way back into the 14th century. A pilgrim who was passing the village of Barcelos in Portugal was wrongly accused of theft. This was a serious offence; if found guilty, the verdict could be death. The pilgrim was brought before the town judge who happened to be feasting on a roast cockerel for dinner. The pilgrim bowed before him and pleaded “If I am innocent, may that cockerel get up and crow!” Lo and behold, the roasted cockerel did just that and the pilgrim was announced innocent! The Barcelos Cockerel has been a symbol of legend ever since, and stands for faith, justice and good fortune. In 1987, Robbie Brozin and Fernando Duarte introduced South Africa to Portuguese-style chicken with the launch of Nando’s, and the Barcelos Cockerel has been their mascot ever since. 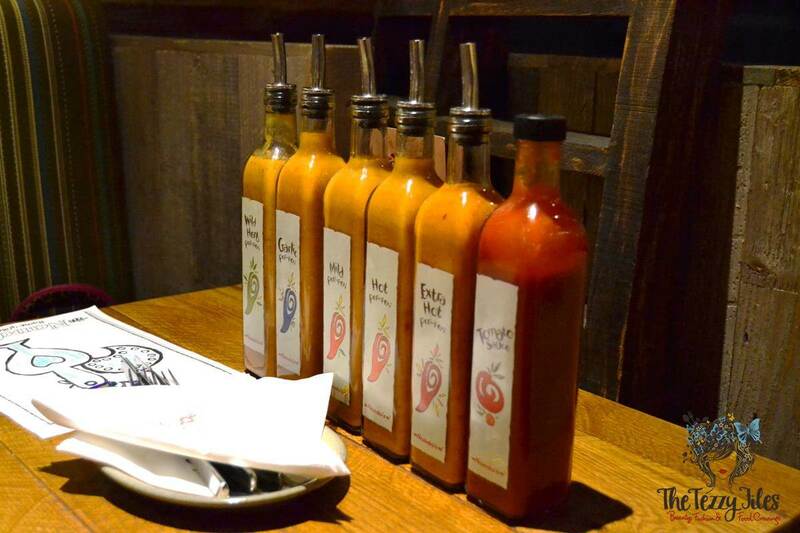 The Nando’s menu has had many new additions in the last four years, yet their signature sauces remain the same. 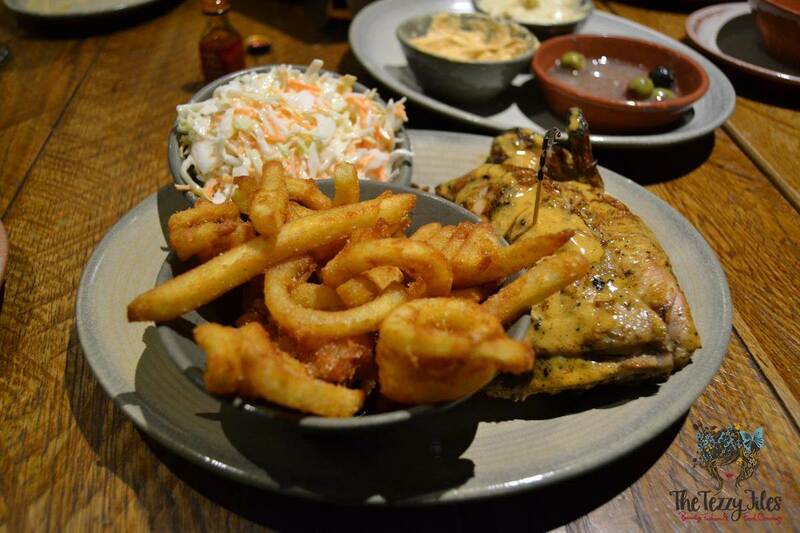 If there is one ingredient that sets Nando’s apart, it is undoubtedly their Peri-Peri. What is Peri-Peri you ask? It is Nando’s secret concoction made of fiery African Bird’s Eye Chili. Their sauces come in 3 levels of hotness to keep every palette happy, and they also have popular mixes like the Lemon & Herb for the chili-phobic. The Al Qasba branch has a cozy rustic vibe with its earthy walls, bare wooden accents and colorful Portuguese artifacts. The branch has alfresco dining overlooking the Al Qasba canal, and given our days of outdoor leisure are numbered, all the tables outside were taken, and we were ushered indoors. Our host for the evening was the Branch Manager, Mr. Riyaz. 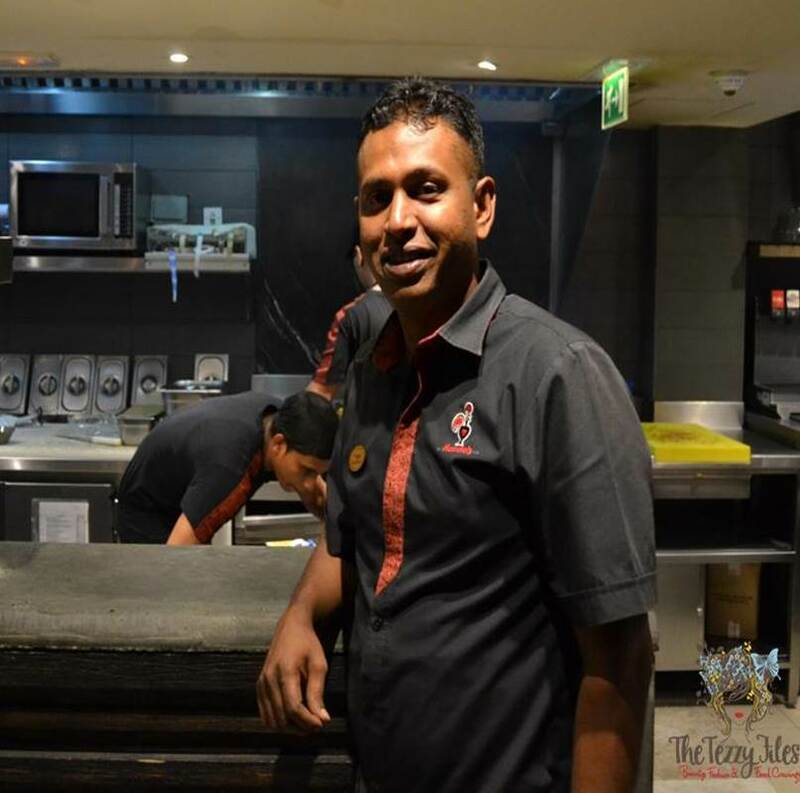 2015 has been a great year for Riyaz so far; he got promoted to branch manager after 3 years of Nando’s service, and recently got hitched. His enthusiasm for Nando’s rubs off on his staff. 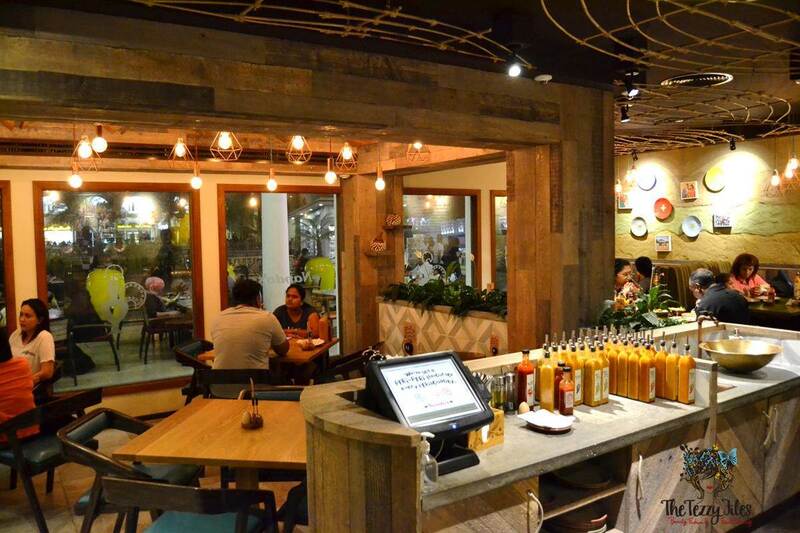 The team at Nando’s Al Qasba are very friendly, polite and really know their chicken. For ‘Appeteasers’, we had the Peri Peri Hummus. 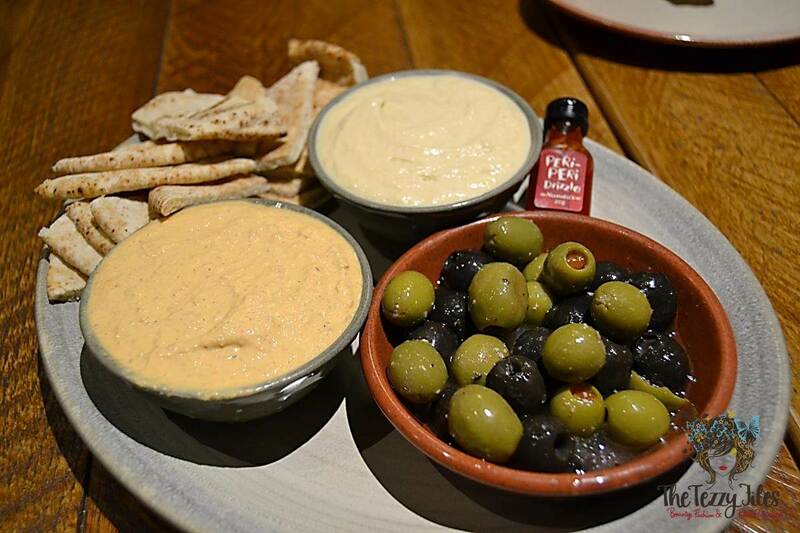 This is Nando’s take on a classic hummus, and the heat of the Peri Peri is as subdued as the pretty pale pink the hummus takes on. The texture of the Peri Peri Hummus is coarser than the plain, well-whipped traditional hummus it is accompanied with, and it has a robust near-smoky flavor. 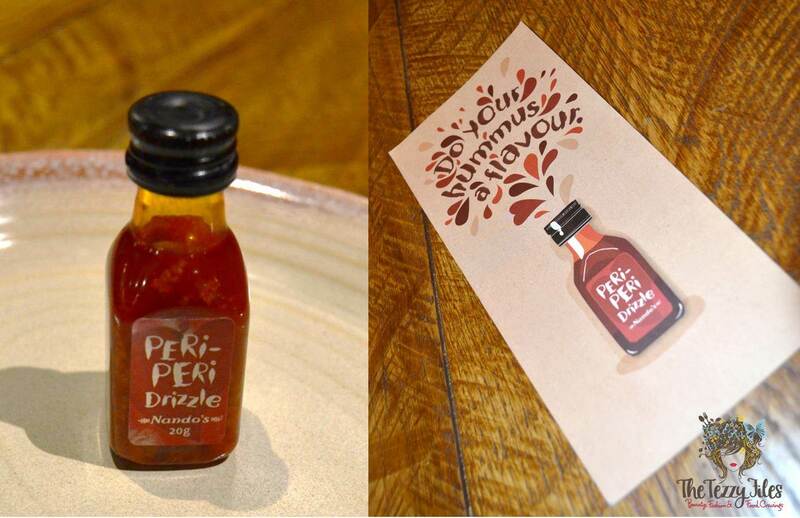 They say the best things come in small packages, and Nando’s 20 gram bottle of Peri Peri Drizzle was just that. Brand new to the menu, the tiny capsule of concentrated bird’s eye chili in a special oil blend gave our round of appetizers a very special kick. ‘Do your Hummus a Flavour’. Don’t you just love Nando’s tongue-in-cheek humor? I would love to meet the talented wordsmith behind these gems you tend to find liberally all across Nando’s. Here’s one we found at the entrance. 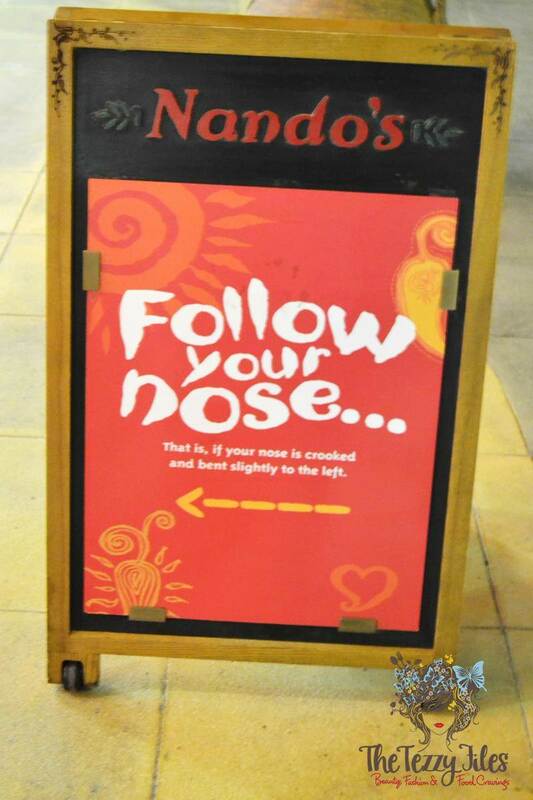 Nando’s fans beware, you run the risk of needing rhinoplasty! Nando’s has ‘Designer Drinks’. These are your everyday drinks with a facelift. 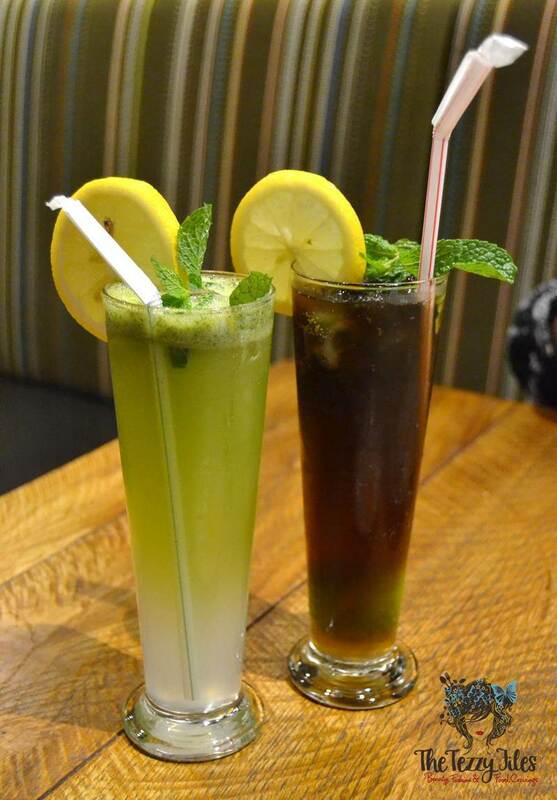 Hubby had an interesting mix of lemon, mint and cola and I had a fizzy lemon-mint. For the mains, hubby had what I had ordered 4 years ago, the 1/2 Chicken in Extra Hot Peri-Peri. For the sides, he chose to have coleslaw and curly fries. Having a far stronger stomach for chili than me, hubby happily finished his meal with no hint of (labor) pain. In fact his only complaint was that he could have done with an extra piece of chicken. As for me, my main was the Espetada Rustica; Nando’s age-old secret recipe for tender marinated chicken thighs stuffed with sun-dried tomatoes. I chose to go one notch down with the chili, and had it at the ‘Hot Peri-Peri’ level. For the side dish, I chose to have a plate of grilled spinach cooked with onion and tomatoes. It went beautifully with the tender chicken pieces, and the tangy sourness of the sun-dried tomatoes gave each spoonful an added ‘rustic’ character. My dish was enough for me and my 4 year-old (who ate most of the hummus and pita anyway, and stole handfuls of curly fries from her father). Nothing beats ending a meal on a sweet note, and for dessert we decided to share a plate of Nando’s Chocolate Walnut Brownie. Sorry for making you drool. All that chocolate sauce and cold, creamy vanilla ice-cream is only the garnish. The brownie itself is warm, soft and deeply chocolaty. For me, a traditional brownie is usually a little chewy and dense. 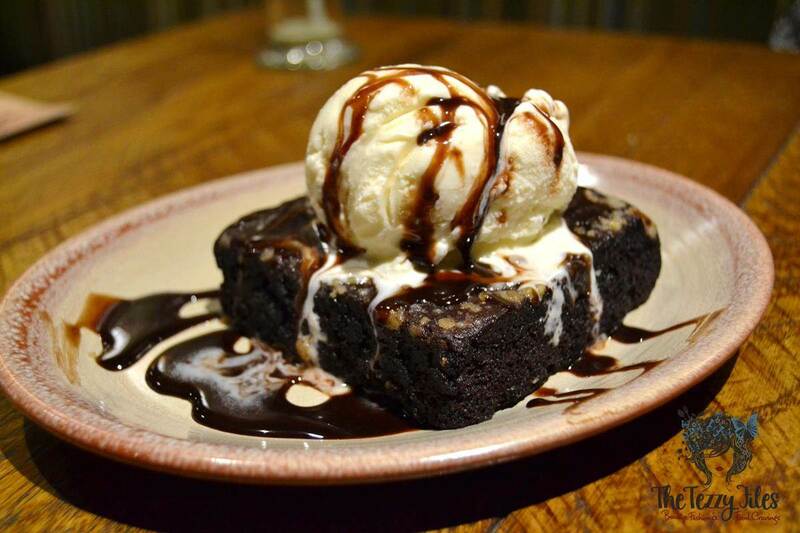 However, the Nando’s brownie is more spongy, and can be likened to a delicious slice of Devil’s Food Cake. It was gone before we knew it; perhaps sharing was a bad idea. 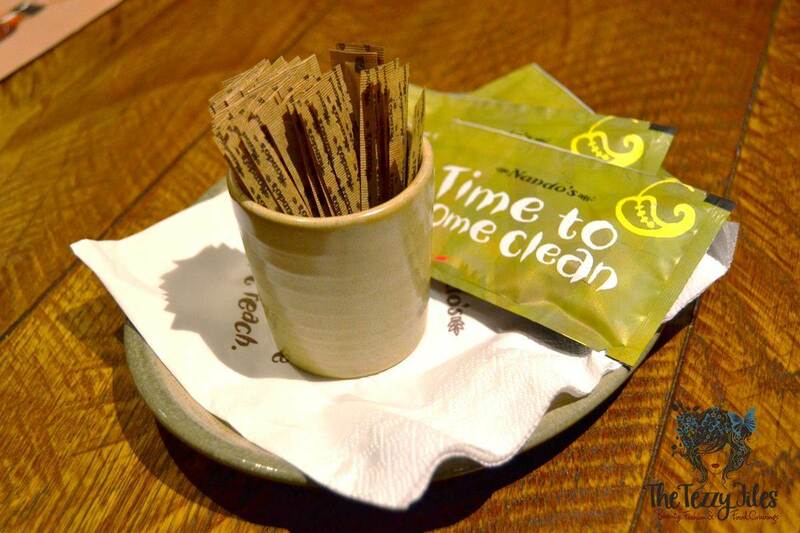 At the end of our delicious Nando’s dinner, we got wet-wipes; ‘Time to come clean’ they announced! Posted in Restaurants and tagged al qasba, anecdotes, dinner, family, food, nandos, peri peri, restaurant, sharjah, story. Bookmark the permalink. I want to go to Nando’s!!! 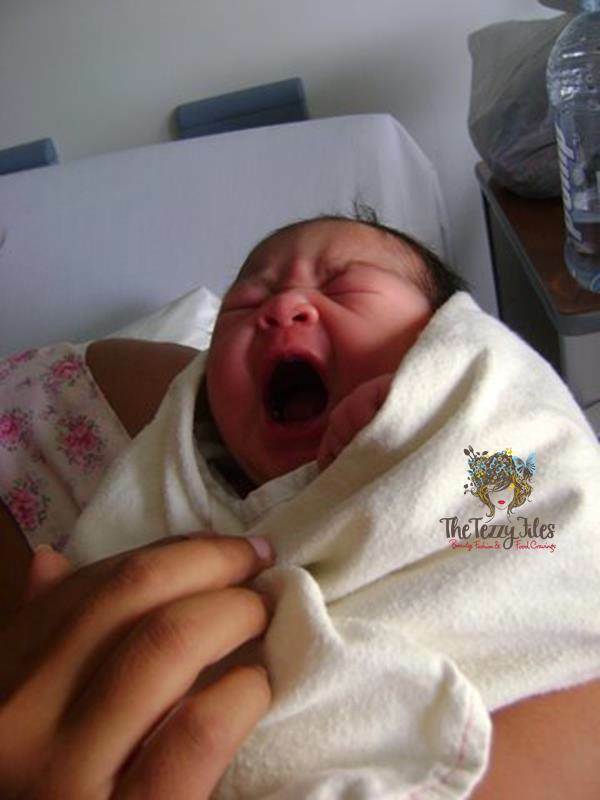 Beautiful baby! If I could travel the world. I have never had Nando’s Chicken, but the photos make it look sooo appetizing. The stories are really fun. I can’t wait now to try their chicken. I would like the mild, but it looks so tender and juicy. The rice looks like it is flavorful, and that brownie with ice cream looks divine. I just know this is going to be a real treat, and a new favorite of mine! Yum yum!